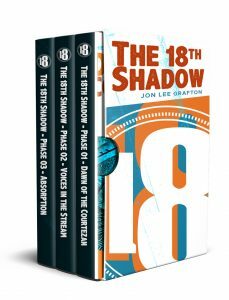 Updated as a second edition and available in digital format only, this box set comprises the first three complete books in The 18th Shadow Series by author Jon Lee Grafton; Dawn of the Courtezan – Phase 01, Voices in the Stream – Phase 02, and Absorption – Phase 03. The Graphene Prairie – Kansas – 2082. The North American Union comprises all of Mexico, Canada and the antique United States. 93% of citizens live with a nano computer consensually embedded in their skull. Alcohol is banned, cannabis is mainstream. Holograms fill our eyes, drones float above the city hovstreets and the Office of the Architect watches everything and everyone. Everyone, that is, except for a particular group of shiners, hand-picked outlaws protected by canine war cyborgs and a charismatic and mysterious telepath named Daxane Julius Abner. Mr. Abner has a purpose. That purpose is freedom. He and his shiners make America’s black market vodka. And they are the only heroes left. Jon Lee Grafton is an indy science fiction author living in the great state of Arizona. He writes about cyborgs, surveillance, environmental dystopia, artificial intelligence and the American drug wars of the future.